CBC members were part of larger team assembled by Crossover Communications International for a Medical and Service Project Mission to Moldova in 2013. Our next mission to Moldova is scheduled for September 2014. Will you go? Will you send? Will you pray? These items will help to support the various projects that are offered during our trip. This year we are reaching out to the women in the village in addition to the children, medical, and community services. 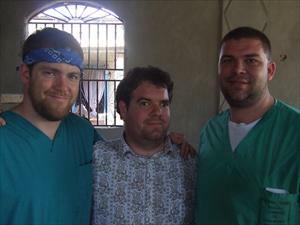 January 2010 was our first trip to Haiti to serve in Medical clinics and preach Revivals. The Lord blessed in a tremendous way! Upon our return, we will be ministering to the devestation of the earthquake victims. 2008, Pastor Kirk ministernig alongside Jerry Cottone, Pastor, FBC Manning, SC. Over 300 Hundred decisions for Christ made through Revivals and door to door witnessing in the poverty stricken villages. If “two are better than one” (Eccl. 4:9), how much better are more than 16 million? This is the current membership in more than 44,000 Southern Baptist churches across the United States. With a global population exceeding 6.5 billion and a command to take the gospel to every nation, we must enhance our cooperative efforts if we are going to fulfill Christ’s command.